"The Vision of Ren Magritte," Arts Magazine, September 1962, p. 14. H. Torczyner, Ren Magritte: signes et images, Paris, 1977, p. 239, no. 498 (illustrated). Peter Ffrench-Hodges, "Tracking faces," The Christian Science Monitor, 30 March 1983, p. 20 (illustrated). J.L. Adams, Conceptual Blockbusting: A Guide to Better Ideas, Reading, Massachusetts, 1986, p. 130 (illustrated). H. Torczyner, L'ami Magritte: correspondance et souvenirs, Antwerp, 1992, p. 123 (illustrated in black and white, p. 91). New York, Albert Landry Galleries, Ren Magritte in New York Private Collections, October-November 1961, no. 45. Minneapolis, Walker Art Center, The Vision of Ren Magritte, September-October 1962, no. 65 (illustrated on the cover). 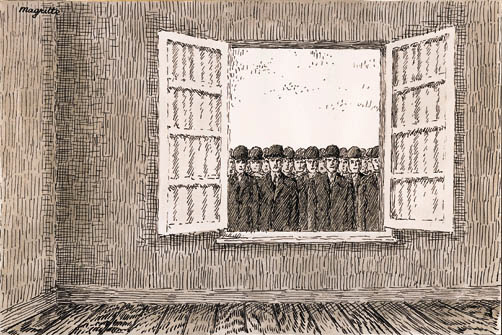 In a letter of 29 December 1958, Magritte wrote to Torczyner, "I am pleased about...the choice of the drawing with the 'portion' of the crowd looking in and which can be seen through the window of a room. You 'have put your finger,' I think, on what is most deserving of exceptional attention? The other pictures are interesting or charming enough, but at the moment, that is the one which best reminds us how strange reality can be, if one has 'a sense of reality'" (quoted in D. Sylvester, S. Whitfield and M. Raeburn, Ren Magritte, Catalogue Raisonn, London, 1993, vol. III (Oil Paintings, Objects and Bronzes 1949-1967), p. 315). Magritte completed the oil painting based on this drawing in 1959 (Sylvester, no. 903; private collection), and in March 1960, Paris Match published a photograph (fig. 1) of Magritte standing in front of it, with the caption: "Ren Magritte devant sa toile: Mois des vendanges parce que 'les hommes sont rassembls en grappes'" ("Ren Magritte standing in front of his painting Time of the Grape-Harvest, so titled because 'the figures are assembled in bunches like grapes'"). (fig. 1) Magritte with Le mois des vendanges. Published in Paris Match, March 1960.